The TIGER HOSE TOWER is a power operated fire hose drying facility that provides a SAFE and EFFICIENT method to accomplish the necessary hose maintenance chore and to preserve a large investment of taxpayer funds. 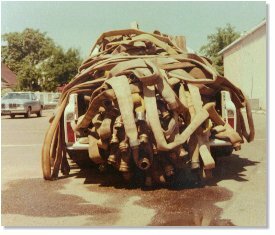 Also, proper hose care is vital to ensure a continuing reliable water supply during emergencies. The tower stanchion is 16 inches in diameter and stands 31 feet high. There is a 6 inch eye beam track on the front of this stanchion for the hose rack trolleys to ride in. The hose rack is powered up and down the tower by an electric driven chain hoist and is available in three standard sizes. We can also provide prefabricated custom wall mount models for an enclosure type installation providing the supporting wall is designed and approved for the stress. We can also provide modified free standing towers for a specific designed enclosure to be constructed around it.